This map, from a large atlas published in Europe, represents a fanciful view of Cuzco. While the once-glorious capital of the Inka empire was surrounded by mountain peaks, as it is here, the layout of the city does not correspond to any lived experience of Cuzco in the 1570s, when the map was published. 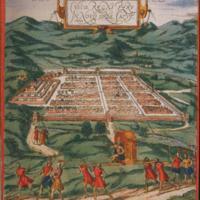 The grid plan of Cuzco may have had symbolic resonance to European viewers, in that it was the ideal form of the city in their eyes. In actuality, Cuzco was much more irregular in form. To the left is Saqsawaman—the terraced fortress at the edge of Cuzco. While the image conveys a sense of its terracing, none of the cyclopean, indigenous masonry of Saqsawaman has been depicted. The Sapa Inka, carried on a litter, appears twice in this image, on the main plaza at the base of Saqsawaman and outside the city, along the central axis of the image, perhaps to signal his importance in pre-Hispanic times. As if to stress the antiquity of Cuzco, the image shows the Sapa Inka’s attendants dressed in clothing resembling Romans. By the time this image was printed in the later 16th century, no Inka ruler would have been carried through the streets of Cuzco. This work was printed on European paper. Deluxe editions of the maps were occasionally hand-colored around the time they were printed. Sometimes, color was added to maps more recently to enhance their aesthetic appeal to modern collectors. The color on this map was probably old. It was laid on quickly, often spilling over the lines of the figures, and suggests rushed work. The colorist seems to have had a limited palette of green, blue and shades of red available. In painting the city of Cuzco terracotta, and the surrounding hills a rich green, this colorist evokes an Italian townscape more than an Andean one. This map is one of the hundreds of city views bound together to create Civitates orbis terrarum, a multi-volume atlas that described the world’s cities. The popularity of this city atlas led to numerous printings of the work, with editions being produced into the early 17th century. They were bought by wealthy Europeans, and today, most major libraries hold copies. Within the multi-volume works, these maps of New World cities were seen alongside other cities, some of them of exotic places, and others quite familiar to European viewers. The maps thus allowed European armchair tourists to survey much of the world. Laboratorio Fotográfico de la Biblioteca Nacional, Madrid. All rights reserved. Keuning, Johannes. 1963. “The ‘Civitates’ of Braun and Hogenberg.” Imago Mundi 17: 41-44. Nuti, Lucia. 1994. “The Perspective Plan in the Sixteenth Century: The Invention of a Representational Language.” Art Bulletin 76: 105-128. Pagden, Anthony. 1993. European encounters with the new world from Renaissance to Romanticism. New Haven: Yale University Press. Schreffler, Michael. 2014. 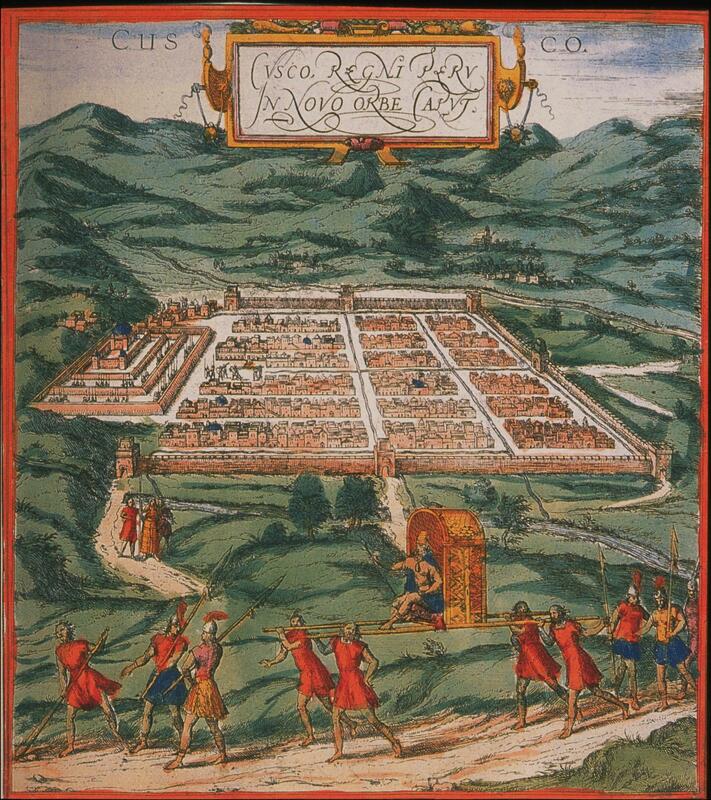 "Inca Architecture from the Andes to the Adriatic: Pedro Sancho's Description of Cuzco." Renaissance Quarterly 67: 1191-1223. Van Mulders, Christine. “Franz Hogenberg.” The Grove Dictionary of Art Online. Oxford University Press.